Declines in ice thickness and volume are just as dramatic. The combination of these trends has led to a decrease in the amount of ice that persists in the Arctic through multiple seasons. Multiyear ice is more stable and less susceptible to break-up than the thin, short-lived seasonal ice that forms each winter. Between 1987 and 2007, the amount of ice at least five years old has plummeted from 57 to just 7 percent. (See figure.) Drastic changes in sea ice cover have led scientists from the University of Washington and the National Oceanic and Atmospheric Administration to predict that the summer of 2037 could see the first ice-free Arctic in a million years. Other scientists have predicted a largely ice-free summertime Arctic as early as 2015. Satellite data indicate that the Greenland ice sheet has been experiencing accelerated melt, particularly over the past several decades. In fact, Greenland’s average annual melt between 2002 and 2005 was triple that of the 1997-2003 period, and the summer melt area on the ice sheet has increased 30 percent since 1979. In recent years, changes in ice dynamics associated with higher temperatures have caused glaciers to flow faster, leading to additional ice loss. Melt water lubricates the base of glaciers that carry ice from the interior to the sea, causing their movement to accelerate (for example, the speed of Greenland’s largest outlet glacier doubled in just five years). Surface lakes propagate fractures through the ice sheet as they drain, further lubricating the base and weakening the ice sheet with a network of cracks. And glaciers have been calving into the ocean with enough force to be detected on seismometers all over the world. The frequency of these “glacial earthquakes” has increased in recent years; in 2005, for example, there were over twice as many quakes as in any year before 2002. All told, Greenland lost 1,500 gigatons of ice between 2000 and 2008, more water than is used in U.S. homes and industry over a six-year period. In the Southern Hemisphere, Antarctica, too, is showing signs of a warming climate. Annual ice mass loss for the entire continent more than doubled between the periods 2002–06 and 2006–09. In March 2009, a 400-square-kilometer piece of ice broke off of the Wilkins ice shelf, the tenth ice shelf collapse on the Antarctic Peninsula in recent times. The most notable break-up was that of the Larsen B ice shelf in 2002, which covered some 3,000 square kilometers, roughly the size of Rhode Island. The West Antarctic ice sheet (WAIS) lost 59 percent more ice in 2006 than it did in 1996. A fast-flowing drainage glacier of WAIS, the Pine Island glacier, experienced a quadrupling in its average rate of volume loss between 1995 and 2006. Previously well-established as stable or even gaining mass, the East Antarctic ice sheet may in fact be shrinking. 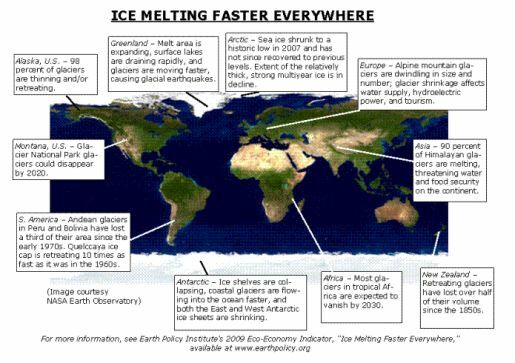 A late 2009 Nature Geoscience study points toward a net melting of the ice sheet since 2006. This new discovery adds to the ever-growing fears of ice sheet collapse and sea level rise. With increased melting, scientists say sea level could rise as much as 2 meters by the end of this century. The glaciers in the Himalayas and on the Tibetan plateau make up the largest body of ice outside the poles and provide water to Asia’s major river systems, which supply water to over 2 billion people. This water is vital for drinking and for irrigating the wheat and rice crops in China and India, the largest in the world. In recent years, Himalayan glaciers have been retreating at rates ranging from 10 to 60 meters per year. As the glaciers disappear, the dry-season flows of river systems that depend on them may decrease by up to 70 percent, making them seasonal rivers. River systems at risk include the Yangtze, Yellow, Indus, Ganges, and Brahmaputra. The Andes, home to 90 percent of the world’s tropical glaciers, are also experiencing rapid melt and a shrinking water supply: between the early 1970s and 2006, Peruvian and Bolivian glaciers lost about one third of their surface area. In Peru, glacier and snow melt provides 80 percent of the fresh water, used not only for drinking but also for hydroelectricity, which supplies more than 80 percent of the country’s power. In neighboring Bolivia, the La Paz governor is already anticipating severe water shortages and considering a program for migration out of the capital city. The 18,000-year-old Chacaltaya glacier, home of the country’s only ski resort, disappeared in 2009.